This is a modern interpretation of the Epiphany story, written in legend form. The story can be easily acted out in drama form. Joseph's workshop was built on to the back of the cottage and the sawdust used to blow under the door of the kitchen, no matter how often Mary swept it. In the winter, Joseph was always busy with the chairs he made for a local firm. He was paid scandalously little for them by the firm, which then sold the chairs to an antique dealer in Chicago. The dealer stained and scratched and battered them very skillfully and sold them as genuine antique wheelback chairs, proving their authenticity by the wormholes, which he had previously made by riddling the chairs with shot. However, Joseph knew nothing of what befell his chairs once they had left his workshop. He did more than make chairs; he was the carpenter and town handyman. When the scales in Mrs. Evans shop were broken and the old woman found with horror that she was giving too generous a measure, it was Joseph who mended them; Joseph who repaired the door hinges and the table legs; Joseph who mended fences and farm wagons; Joseph who could put new handles on spades and hoes quicker than any other man in the neighborhood. The cottage used to resound with the hammering of the nails and the drone of the sawing. Mary had long ceased to notice it and the child had lived a whole year in the sound and had apparently grown as used to it as His mother. Life was as uneventful for them as for the rest of the people. It was work — commonplace, monotonous work at that — varied by petty worries, like the smoking chimney that couldn't be cleaned because it cost money, or the speed with which Joseph's boots wore out. And, more ominous, the ever recurring fear that Mrs. Evans would suddenly refuse to give things on credit. While this life was going on, the three wise men were making their way together over the hills that surrounded the little town. They came on foot, tired and bedraggled, led by the star. One of them was rich, judged by the world's standards. He had begun his journey in the comfort of a first-class compartment in the streamliner out of San Francisco; he had crossed the country in luxury, in search of the child. The second had followed the star from a concert hall in London. He was a singer; he had traveled carefully, frugally, with one eye anxiously on his money, for a growing reputation and wealth do not always go hand in hand. But the third wise man was penniless. He had tramped and begged his way across Europe, from Poland through Germany to France, across the ocean to New York, and so to this town in the hills of New England. 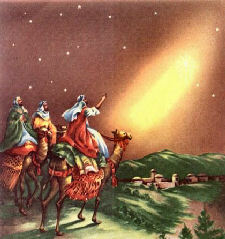 The three men followed the star. Along the rough track, past the sprawling farm of Jonathan Cartwright, over the bridge, past the railroad station and the first neat white cottages. They looked around uncertainly. There was the general store, the post office, a small row of dilapidated hovels of houses, and a little apart, a cottage. It was a plain, commonplace New England cottage, with a field stone fence around the trim garden plot. The smoke blew gustily from the chimney. And here the star stopped and the wise men never saw it again. Here, then, was the king to be found. Strangely enough, the door was not fastened. The poor man opened it gently and the others gazed in over his shoulders. It was absurdly unregal for the king they had traveled across the world to see. For the woman standing there was laughing with a baby who sat in a high chair. A blue plate rested on the tray of the chair, and she was feeding Him with a small spoon. As they entered, the woman looked up quickly, but without surprise; she might have been expecting them. The child stared, immediately forgetful of His dinner. His eyes followed Mary as she took the blue plate and laid it on the kitchen table. Then she quietly untied the bib from the child's neck, smoothed His hair, and left Him sitting in the high chair. She said no single word to the wise men, but she knelt suddenly before the chair and the men fell on their knees with her. The rich man fumbled in his pocket and dragged out a large box. "Lord," he said, "what I bring you is only what you have lent me — gold. But you made it, you put it in the earth for us; you allowed us to discover it. You have lent me so much, Lord — money and influence and power. You have let me use all the resources of the earth — timber and steel, coal and oil, wheat, silver and iron. The gold that I give you speaks for all those things." As he spoke he emptied the box on to the tray of the chair. Rare coins, gold and silver, from every land under heaven lay heaped there. Attracted by the glimmer of the gold, the child clasped His fingers round the largest coin and, laughing silently, dropped it on to the floor. It rolled over the floor and hid itself under the dresser. The rich man put his hands over the coins and said to the child: "All these I give back to you, for they were yours in the beginning. My job is to see that they are used in your honor." "Lord," cried the singer, unrolling his music, "my only gift is to praise you with the gifts you have given me." And his voice fell softly on the ears of Mary and the child. "Lift your hidden faces. Ye who wept and prayed; Leave your covert places, Ye who were afraid. Joyfully foregather Sorrow now is done. We have found a Father, We have found a Son. "You have given me gifts, Lord," he said, "and I bring them back to you; help me to use them; help me to increase them, for they are not things of my own. They are only lent me to use in your service." And as he spoke Mary saw all the praise that was meant for the child and that would never be used for Him, the talents that would be turned against Him — the music, the singing, the writing, the acting, the eloquence. The third man had risen to his feet. He looked like a scarecrow; his clothes in rags, his feet gaping through the holes in his boots, his hair hanging over the collar of his threadbare coat. "Dear Lord," he said softly, and he spoke in Polish — but by some miracle they all understood him — "Dear Lord, I have nothing to give you, only poverty and suffering, and I've walked over half the world to give it to you. I don't come alone; I'm one of an army who send you the same gift. I'm their ambassador," he said quaintly, falling on his knees again and grasping the arm of the baby's chair in his hands. "I'm here for everyone who suffers, for the persecuted Jews, for my own country, for the broken cities of Europe, for the battlefields of China and Korea and Vietnam." He clasped his hands together; they were black and their nails broken. "It was wrong to say that I had nothing to give you; nothing greater than suffering can be given. Take the poverty of the homeless and the starving; the agony and pain in all the hospitals in the world; take the suffering from the concentration camps, the loneliness of the refugees; the anxiety and terror of those who have been torn from their families and driven from their homelands. Accept them all," he prayed. And so the three wise men came with their gold, frankincense and myrrh. And the child accepted everything they gave Him, the power, the praise and the suffering, while His mother laid up their words in her heart. — Reprinted from Grail Bulletin.